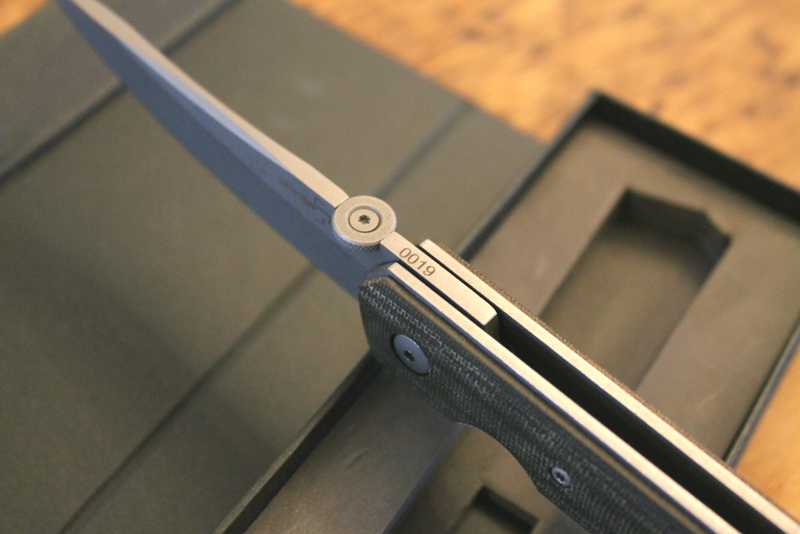 The Boker Plus Folding Kwaiken could be called a large gentleman’s folder. Though its handle is a bit over four inches in length, it is straight and slim in form. 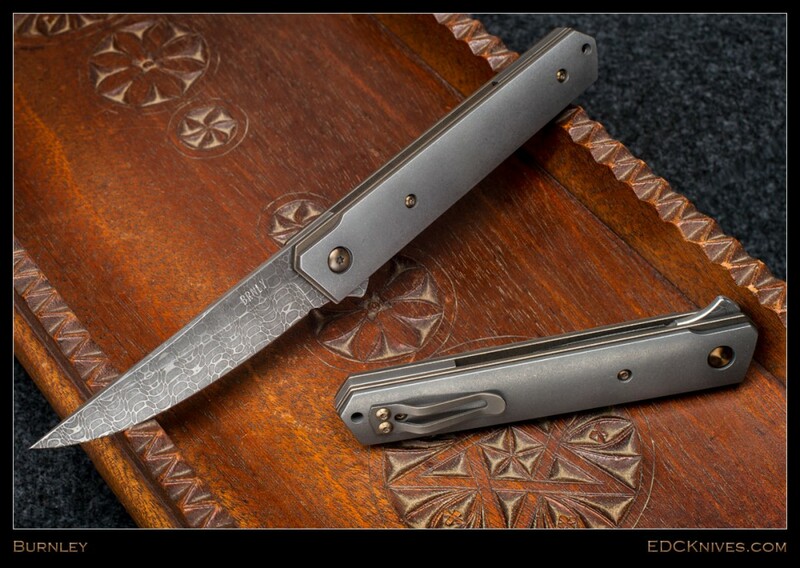 Steel liners underlie thin green canvas Micarta scales. Canvas Micarta is an excellent choice for this svelt handle because of its inherent grippy texture, wet or dry. 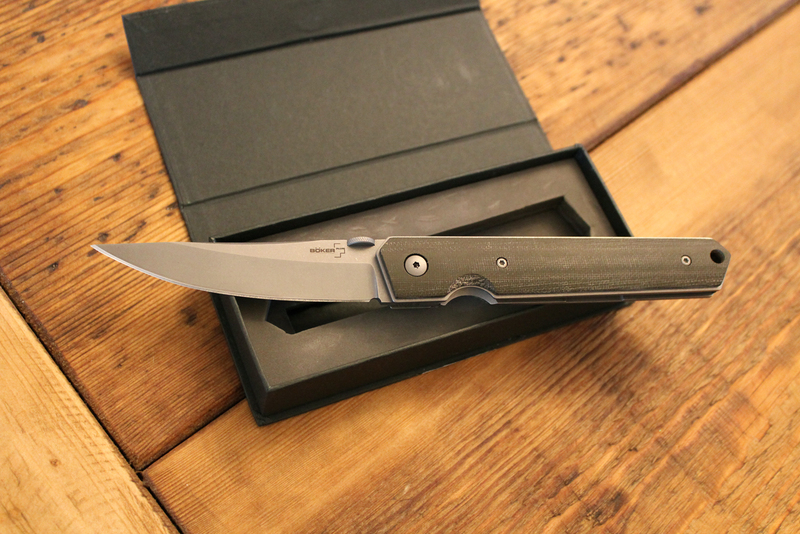 All the steel fixtures on the Kwaiken have a nice tumbled finish that not only subdues the surfaces, but adds an interesting visual appeal to the knife. I originally thought the black backspacer between the liners was plastic, but upon disassembling the knife I found it to be made of canvas Micarta. Kwaiken’s hollow ground 3 1/2″ blade is AUS-8 stainless steel, which is Aichi Steel Corporation’s moderate high carbon stainless steel with vanadium added for wear resistance. Its Rockwell Hardness is not mentioned by Boker. In everyday chores, my edge has held up well and I have not yet needed to resharpen it. The blade’s spine has a slight swedge and the edge is upswept. Plenty of steel remains at the tip. This blade has an aggressive appearance. Ikoma and Korth’s patented IKBS system rolls the blade smoothly open, where it is secured with a Walker liner lock. I found my blade to lock-up perfectly without side play. It also centered itself with precision into the handles with a nice click to the detent. 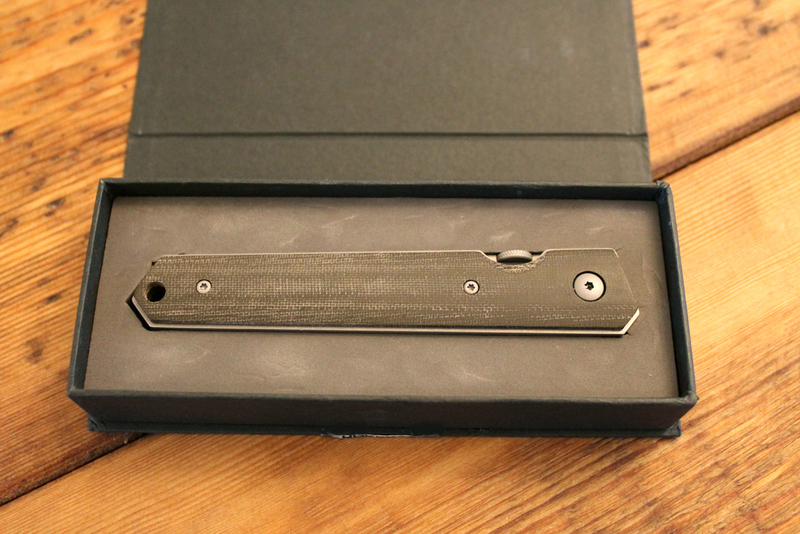 The Kwaiken’s innards are held together with Torx screws throughout. Though this knife can be seen as a defensive folder, I had issue with the small cutouts and the tough-to-access thumb disk. You really have to dig your thumb in to get the blade to overcome the detent. It is not what I would necessarily call “defense ready.” That’s okay if you carry it for just utility, but if your knife is meant for potential combat, I’d suggest CRKT’s Hissatsu or upcoming Otanashi noh Ken (which I hope to see at SHOT Show in three weeks…). A short pocket clip is mounted on the right side handle. It is not reversible. It is positioned for low carry in the pocket. A lanyard hole is included at the knife’s rear. Overall weight is 4.2 ounces. I am impressed with the Boker Plus Kwaiken’s quality build. It is well worth the $149.00 MSRP, or the $95.95 I actually paid for it. This entry was posted in Knives and tagged Boker Knives, Boker Kwaiken, Folding Knife, Lucas Burnley. Bookmark the permalink.